The countdown to Christmas is on! So many of you made me feel so much better that you are not done with your shopping (or haven’t even started!). One of my hardest people to buy for are girls! More specifically my stepmom (Melmom). She is the hardest person in the world to buy for but I think this year I’ve finally got her covered! 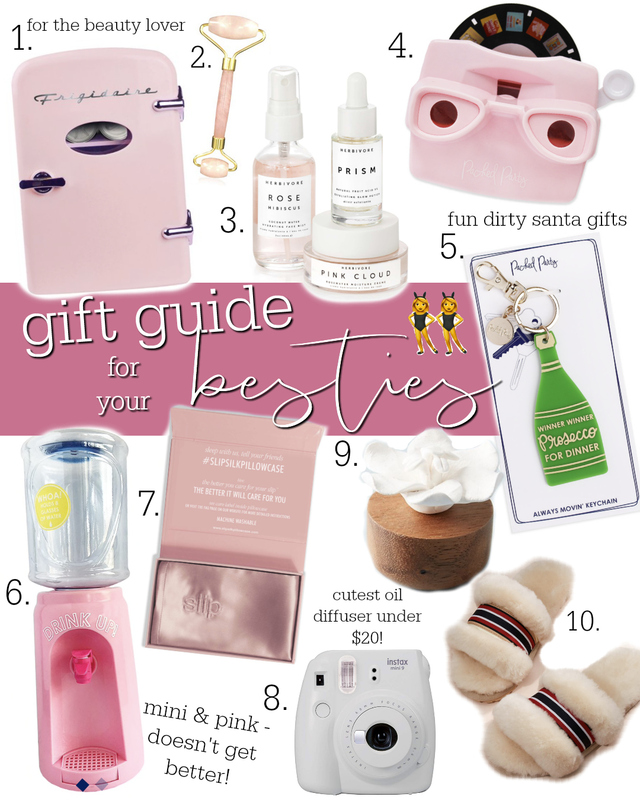 Check out my Gift Guide for your Best Friend below and let me know what you think! 1. Retro Mini Fridge ($20) // I know you’re like why would my friend want a mini fridge?! But LISTEN. This is a beauty fridge for your bathroom! You can keep things like your eye rollers, eye patches, hydrating masks, and eye creams in it. This is one of the things I got my Melmom this year because she is SO hard to buy for. 2. Rose Quartz Roller ($12) // The perfect addition to your mini fridge gift or pair with my favorite sheet masks for a great Dirty Santa gift. 3. Botanicals Trio ($54) // This little trio is so chic and PINK! Can you tell it’s my favorite?! It includes Rose Hibiscus Coconut Water Mist, Exfoliating Glow Potion, Rose Water Moisturizer Cream. 4. Compliment Reel ($28) // How cute is this?! This retro little cutie has tons of fun slides that just give you compliments! This would be a unique dirty santa gift or stocking stuffer. 5. ‘Winner Winner Prosecco for Dinner’ Keychain ($18) // The one size fits all, perfect gift! I love this keychain and think it’s perfect for any bestie or gal on your list. 6. Mini Beverage Dispenser ($42) // This is so fun for your BFF’s bar cart! It holds 8 Glasses of ‘Water’ but let’s be real, it’s meant for Rosé. Also gifting this to my Melmama for her closet! 7. Slip Silk Pillowcase ($85) // Every girl should have a silk pillow case. It’s so great for your hair and skin, plus feels like you’re sleeping beauty! 8. Fujifilm Instamax Mini ($55) // My sweet friend Natalie gave me a Polaroid for my birthday and it was one of my favorite gifts. It’s so much fun and so great at capturing memories. 9. Floral and Wood Oil Diffuser ($19) // I love this diffuser! We are doing Dirty Santa next week and I think this is my gift. I also LOVE this jeweled and gold diffuser. 10. Emu Slippers ($59) // My FAVORITE slippers ever and finally back in stock but going FAST. Check out more gift guides HERE.